Pot scrubbers, also known as scrubbies or tribbles, are easy to make. They can be knitted or crocheted. Besides being practical, scrubbies are a good way to use up yarn scraps and can be finished in a matter of minutes. If you need a little something to keep your hands busy, try knitting a scrubbie. 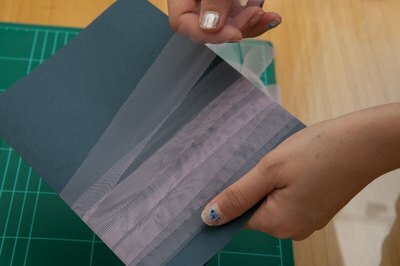 Lay the netting (or tulle) on a cutting surface and cut strips along the long edge. Each strip should be about 1-1/4 inch wide. Four strips should be sufficient for one scrubbie. Knot the strips into one long strip using an overhand knot. Trim excess netting ends from the knot. Wind the long netting strip onto the cardboard or paper towel roll to prevent tangling. Begin to knit the scrubbie by holding the yarn and netting together. Cast 15 stitches on to the knitting needle. Knit each row until the scrubbie is 5 inches long. The scrubbie pattern can easily be altered by casting on more or fewer stitches, and knitting until the desired length is reached. Bind off and weave loose ends into the scrubbie to finish. Netting is difficult to work with. It may be less frustrating if all of the netting is cut into strips, rather than cutting some of the netting and coming back to it again later to cut more. Cotton yarn is absorbent, washable and often used for dishcloths. However, acrylic yarns can also be used for scrubbies. Acrylic yarns come in a wider variety of colors than cotton yarns. 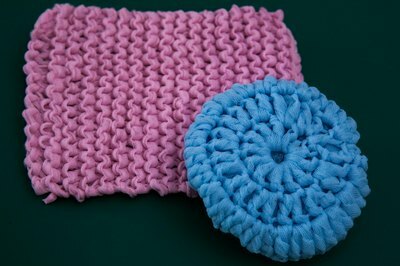 Any knit or crochet scrubbie pattern can be altered to add netting. Simply cut the netting into strips and knit or crochet as usual, holding the netting and yarn together. Do not put your scrubbie in the dryer -- the netting can melt.